The well-publicized bankruptcy of Lehman Brothers Holdings, Inc. (LBHI, Lehman) on September 15, 2008 had a profound impact on global financial markets and highlighted several weaknesses in the resolution framework of a large, complex financial institution (FI). Lehman’s Chapter 11 bankruptcy filing proceeded in a disorderly fashion, as both the firm’s executive management and financial market participants were surprised by the timing of the event and by the absence of financial support from the US government. Chapter 11 proceedings are designed to provide troubled firms with protection from creditors and provide an opportunity to restructure and reorganize. Unfortunately, in Lehman’s situation, a major portion of the firm’s obligations were tied to OTC derivatives products, that do not materially benefit from Chapter 11 protections. A majority of Lehman’s contracts were automatically terminated (due to contractual cross-default triggers) and a large number of the remaining positions were selectively closed-out by Lehman’s counterparties (under safe harbor provisions). o Automatic early-termination of OTC derivative agreements, triggered by cross-default provisions, resulted in the immediate forced settlement of over 80% of Lehman Brothers, Inc. (LBI) contracts. Congress took a key initial step to address the above issues by passing of the Dodd-Frank Act (DFA) in 2010. Although the DFA did not provide direct regulations, it granted the Federal Deposit Insurance Company (FDIC) with the Orderly Liquidation Authority (OLA). Under the OLA, the FDIC is designated as the receiver of a large complex FI and is granted a stay of two business days, during which counterparties are prevented from terminating QFC contracts with a failed FI. The OLA, combined with Resolution and Recovery Planning (RRP), QFC Resolution Stay and QFC Recordkeeping regulations are the fundamental (non-capital related) mechanisms deployed by the US regulatory agencies to prevent a Lehman-like scenario in the future (see Exhibit 1 below). The remainder of this paper focuses on the QFC Recordkeeping rules, which are specifically designed to prevent a repetition of the reconciliation delays and legal uncertainties that transpired during the Lehman resolution. We focus our attention here on regulations passed by US agencies rather than address regulatory actions in other jurisdictions where similar safeguards have been implemented. The QFC Recordkeeping Rules provide the FDIC with the immediate information needed to fulfill its capacity as the receiver (when exercising its OLA) of a failed complex FI. The QFC reporting of a failing FI includes a detailed inventory of all open QFC positions to all of its counterparties, including its affiliates. Once appointed as a receiver, the FDIC is granted two business days to decide whether to transfer (to a non-failed entity), disaffirm or repudiate all transactions under a single netting agreement with a single counterparty. There are two separate QFC Recordkeeping rules that generally apply to FIs with total assets in excess of $50 billion, which will go into effect in March of 2019. The March 2019 date applies specifically to the largest US firms with assets in excess of $1 trillion. The FDIC’s rule (Part 371) applies to Insured Depository Institutions (IDI) that accept FDIC-insured deposits. The rule published by the Department of the Treasury (Part 148) applies to non-banking entities, such as broker-dealers, swap dealers, and other legal entities that enter into QFC agreements. The reporting requirements under both rules are nearly identical and the FDIC is the recipient of both the Part 371 and Part 148 reports. The regulatory definition of a QFC captures the following five broad categories: securities contracts, swap agreements, repurchase agreements, forward contracts and commodity contracts. A practical way to think about a QFC is that it includes all legally-binding agreements between two (or more) parties that govern the purchase, sale or repurchase (or guarantee) of a financial instrument. Examples of positions governed by QFCs are regular-way purchases/sales of shares, derivatives transactions, and repurchase transactions. In order to avoid confusion, it is helpful to distinguish between QFC agreements (such as an ISDA master agreements) and QFC positions, which are all the positions that are governed by QFC agreements. The QFC rules require firms to complete eight separate reporting tables. The first four Data Tables (labelled A1-A4) contain the high-level information required for the FDIC to assess a firm’s QFC positions vis-à-vis all of its counterparties. · A-2 – Counterparty Netting Set Data – Aggregated QFC and collateral positions covered under a single netting agreement. Together, the eight tables contain a total of 128 data fields, of which 96 are unique attributes. The tables are intricately linked so that the FDIC can gain an accurate picture of a failing FIs overall QFC obligations. Both Part 371 and 148 reports need to be provided to the FDIC based on an on-demand basis and are not part of a regularly scheduled regulatory submission. However, FIs are required to develop the capability to submit the reports to the FDIC by 7AM the following business day. 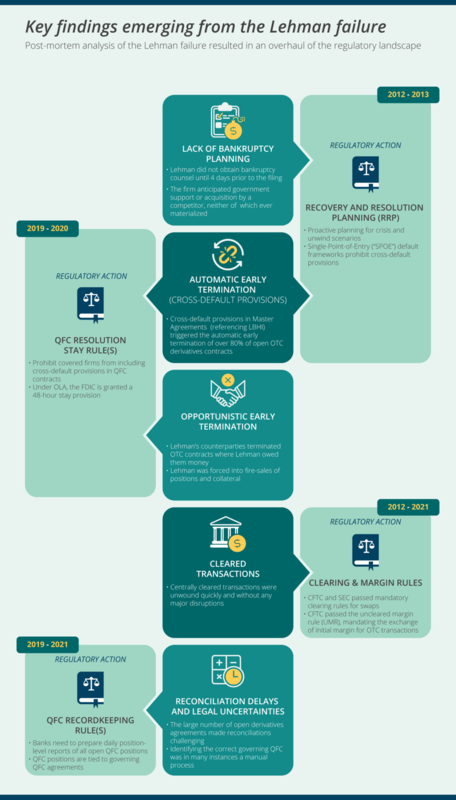 The reports directly address the regulatory findings related to reconciliation delays and legal uncertainties that emerged following the Lehman bankruptcy. In addition to the eight reporting tables, FIs need to provide the regulators with access to a full QFC-related legal agreement repository. The rules further require a detailed listing of 3rd party vendors and affiliates that provide critical QFC-related services. The broad nature of the QFC Recordkeeping rules requires FIs to perform extensive upfront scoping work to ensure that all legal entities and QFC products are properly identified. For large institutions, this requires a detailed review of the corporate organization chart and a detailed analysis of a firm’s QFC activities in capital markets, prime brokerage, treasury, asset management and retail areas. Sourcing all of a firm’s QFC position and collateral will typically require the evaluation of multiple systems-of-record (“SOR”) and a translation of their data fields into the reporting format required to satisfy the QFC Recordkeeping rules. Most SORs do not capture all of the reference information required under the QFC Recordkeeping rules. For instance, the immediate parent company of a counterparty or safekeeping agent contact information is not typically stored in SORs that capture QFC position or collateral information. Similarly, most SORs do not formally link QFC positions to QFC agreements or identify loan exposures that may be linked to a QFC exposure. 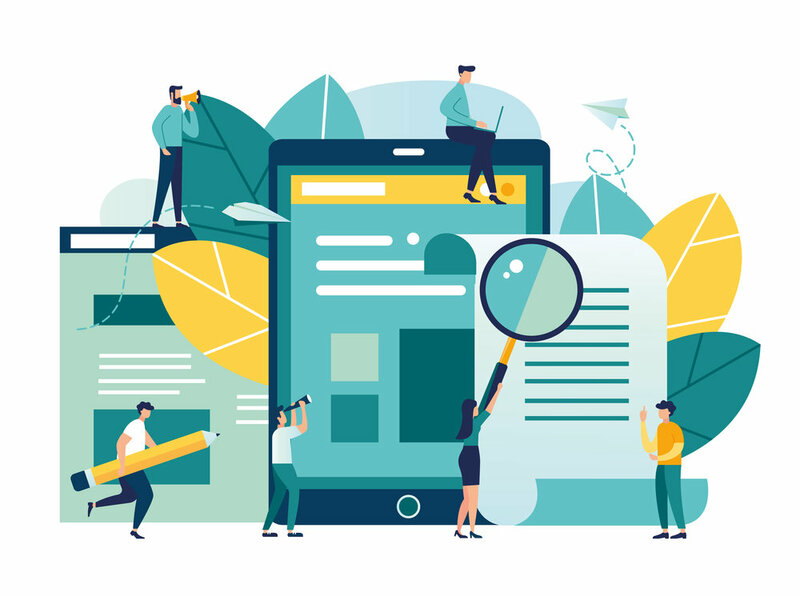 The identification and sourcing of indirect QFC exposures, such as guarantees or other credit enhancements of QFC positions, present another challenge that FIs need to address as part of the implementation planning process. The largest US FIs (firms with total assets >$1 trillion) have made significant progress in the implementation of their QFC Recordkeeping capabilities. However, as of Q3 2018, several industry exemption requests that were submitted through The Clearing House and Securities Industry Financial Markets Association (“TCH/SIFMA”) group in early 2018 remain unanswered. In recognition of this, as well as the broad scope and significant resources needed to implement the requirements, the regulatory agencies moved the initial compliance date from June 2018 to March 2019. Monticello Consulting Group (MCG) assists clients across the financial services industry in implementing the necessary infrastructure to ensure compliance and reduce regulatory risks. This experience, coupled with our in-depth knowledge of the financial regulatory environment, uniquely positions Monticello to guide financial institutions, regardless of their size, in the adoption of emerging technologies in the regulatory reporting space and the implementation of strong QFC governance principles. It is more intuitive to think of the table in the following order A-1, A-4, A-2, A-3 instead of the numbering scheme provided by the regulators. A-1 and A-4 contain the position and collateral level data that are linked by the netting agreement identifier that provides the aggregation basis in the A-2 table. The A-3 table contains the legal agreement that are linked to positions and netting sets and fulfils a similar reference function to the Master Tables.